When Susan Hardy Brown first volunteered at the Arnold Arboretum of Harvard University in 1985, she never thought she would spend the next 25 years saving bits of leaves and sprigs of grass for her artwork. Hardy Brown is an artist by training and a nearby resident and frequent visitor to the lush, 265-acre landscape that is a haven for both research and relaxation. Initially, she simply offered to scrounge the grounds for forsythia and lilacs for a curatorial review of the living collections. “I didn’t even know what a herbarium was,” she said. Now she does. A year later, Hardy Brown joined the staff of the Herbarium of the Arnold Arboretum (one of the six that make up the Harvard University Herbaria). Since then, she has been meticulously collecting, sorting, pressing, mounting, labeling, and recording the thousands of plant samples received each year from around the globe. For Hardy Brown, the work has also become a major source of creative inspiration. Extra twigs, pressed flowers, and seeds are central to her art, as are the eclectic packing materials in which they arrive. Hardy Brown’s first solo exhibit at the Arboretum, “Ex Herbario: Recent Works by Susan Hardy Brown,” is now on view at the Hunnewell Visitor Center through Sept. 16. Susan Hardy Brown’s artworks are both ethereal and earthly, done largely through the encaustic medium, an artistic technique that involves applying heated beeswax to a surface to coat and seal its contents. 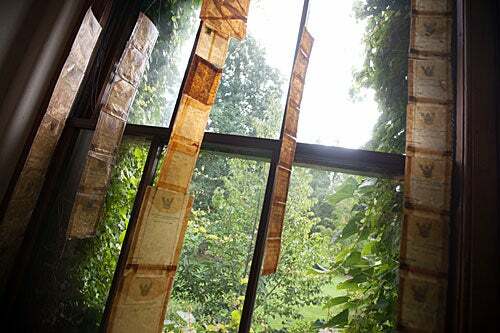 The ultimate recycler, Hardy Brown fuses the ephemera and extra material she has collected from her personal life and her professional life as a processor of plants. Her artworks are both ethereal and earthly, done largely through the encaustic medium, an artistic technique that involves applying heated beeswax to a surface to coat and seal its contents. “I’ve obtained almost all of the materials through working here, whether it’s directly through my job or just by people giving me things because of the work I do,” she said. Many of those things come from a corps of collectors in the field who send Harvard plant samples in packaging as diverse as the flora it contains. Tiny bits of Arctic tundra, or tree ferns from New Guinea, come wrapped in things like a brightly colored potato chip bag from Thailand, or a British newspaper from the 1960s. Those materials caught Hardy Brown’s artistic eye. “I’d always wanted to merge the two, and I think I always felt that it was so rich in ephemera and materials that I could use, I just started saving stuff,” she said. Some of that “stuff” makes up Hardy Brown’s version of a prayer flag. Hanging in the entrance to the show, “Chang Mai Prayer Flags / for Dr. James Maxwell” is composed of small bags from Thailand that once held fabric softener or dried fruit. The plastic pouches are the shipping material of choice for Maxwell, a prolific collector. 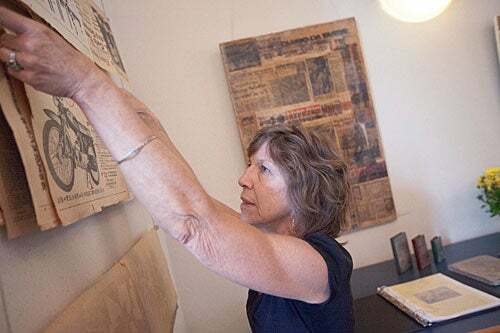 Images of Frank Sinatra and bride-to-be Mia Farrow from a page of the Boston Herald newspaper dated July 14, 1966, appear as a backdrop to an adjacent work in the show. The collage includes seeds from a type of mahogany, seedpods from a legume, slivers of grass, and the envelope from an airmail letter. While the world inspires much of her work, so do other artists. Woven through the show are pieces that are clever tributes to contemporary masters. One piece both evokes artist Andy Warhol’s iconic works that feature repeated images with slight variations and calls to mind the repetition involved in her own processing and cataloging. But “Flowers for Our Lady of Charity / for Ruth” is also a personal tribute to her mother. Photocopied pictures of the patron saint of Cuba appear in a repeating pattern alongside pressed flowers from magnolias, Korean dogwoods, and black-eyed Susans. Artwork by Susan Hardy Brown hangs in the window. Above all, Hardy Brown hopes the works in the exhibit will help to showcase both her art and the important work of the Arboretum. Ben Brady's turntable can be used for creating 3-D images of artifacts, a valuable tool for scholars who may increasingly rely on digital representations of archived artifacts. Brady was among the participants who showcased his project at openLAB_Summer, a reception sponsored by metaLAB's at Arts @ 29 Garden.